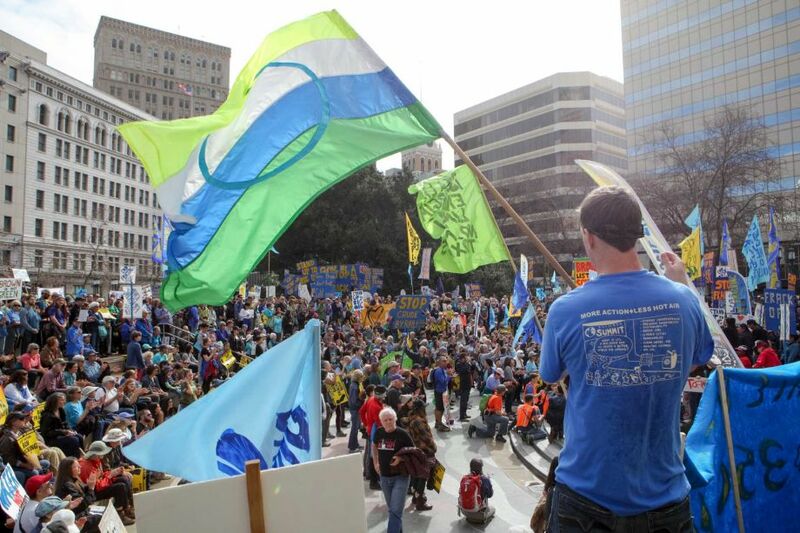 Several thousand demonstrators turned out in Oakland Saturday for a protest against hydraulic fracturing in California. The controversial technique, also known as fracking, uses high pressure water and chemicals to harvest oil and natural gas. The demonstration was one of the largest public against fracking recently, and it was held in Governor Jerry Brown’s home town of Oakland for a reason. Environmentalists are taking aim at Governor Brown who used to be a political darling of the movement in his first tour as governor in the 1970’s. Event organizers say Governor Brown’s administration has given a green light to oil companies to drill in California. The state is the third highest oil producer in the country. “I came up by bus this morning. And I’m doing this because I believe in a future for all human life and all life on earth, and I believe it’s time for us to create a whole other way of being human,” said Cindy Dixon of Paso Robles. During a news conference Friday, Governor Brown challenged protesters when he said they, along with most other Californians are still getting around on gas guzzling cars, trucks and buses. Gas prices have been falling dramatically in the last six months, in part because of increased oil drilling in the United States. But it’s also because newer cars are more fuel efficient, and countries like Saudi Arabia have continued to pump oil despite a worldwide oil glut.